If I’m not working with my clients, I’m probably working on building my email list and community. Some business owners never make it to the 1000 subscriber mark, and I just deleted 1000. Other business owners might think I’m crazy, but I had to make a tough call. Ultimately I did it because the cold subscribers were draining my energy. I was constantly focused on how can I re-engage them and why they didn’t like me. But in keeping these cold subscribers on my list, I wasn’t creating space for what I wanted to call more of into my life, nor was I serving who WAS there with my full attention. Sure, even though those 1000 subscribers *could* be clients one day, today, ​they were sucking my energy. I tell you this because I think there’s someone or something we ALL need to prune from our lives. Maybe it’s a friend who only talked about herself, maybe it’s an ongoing commitment you want to get out of, or maybe it’s that guy you’ve been kinda sorta texting with. I believe that you have to create space for what you want in your life, and with 1000 cold subscribers I was obsessing over, I wasn’t doing that. And keeping that guy around that you know isn’t ever going to go anywhere is crowding out a potential someone who really WANTS to be there. 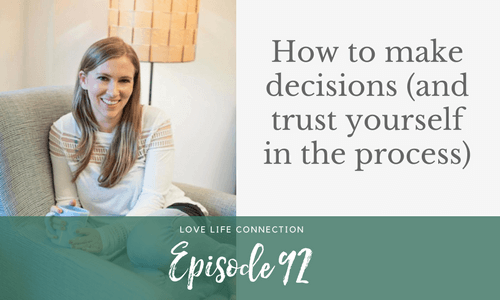 Obviously deciding to prune people or things in your life is easier said than done (trust me, I sat there with my mouse hovering over the delete button for a good 20 minutes), which is why I think you’re gonna love today’s episode on the Love Life Connection Podcast. I walk you through three different tools to help you make a decision AND trust yourself in doing it. I’ve also included a free bonus meditation you can use anytime you need to make a decision, big or small.